Mum was looking at one of her books about cats. 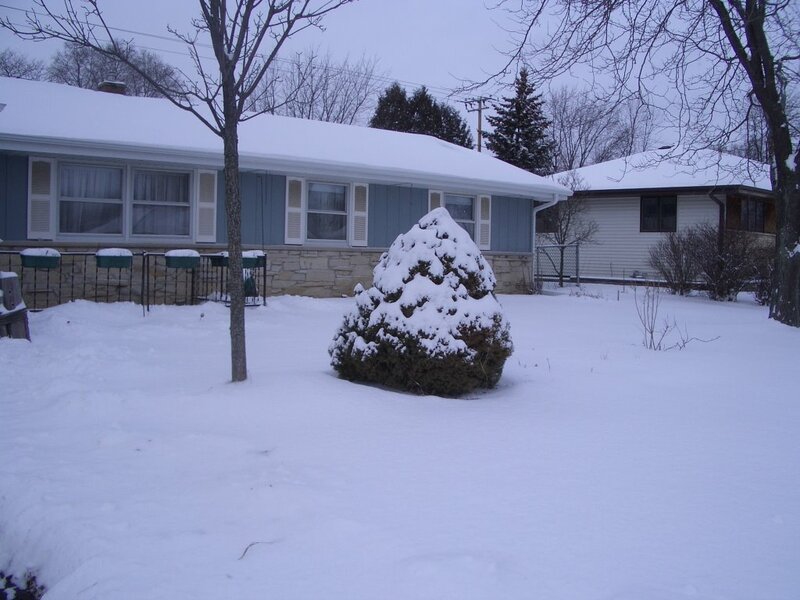 The ideal temperature for us inside a house is between 62-72 degrees Fahrenheit. So make sure that fancy thing on the wall is set so it doesn't get to hot or cold in the house. Also, anything over 90 degrees Fahrenheit, we should be inside with air conditioning. And we should not be outside if it is below freezing. 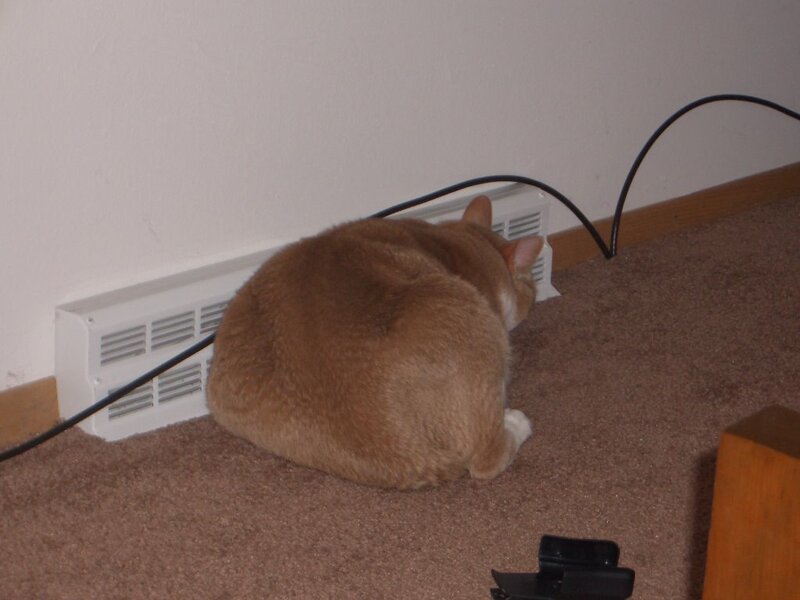 Lux was mentioning the other day that they had no heaty thing working in the house. Not good on a winter day. So make sure your beans keep the house just right. Curl up with something or someone to stay warm. Mum was all bundled up today, even more than usual. It was furry cold outside the past few days. Sunny but cold. And it is supposed to get much colder over the next few days. 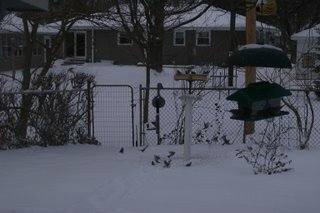 Mum had to go out and fill all the feeders for the fevvers. They ated it all as they need extra foods to stay warm. And I loved reading where you say you all live. I do feel like I could be in your neighborhood and find where you are. It is probably just easier to teleport in, but if for some reason I teleported wrong, I would be able to find your places. Plus mum has just gotten home and the door bell rang. Of course I had to go and see who had come to visit. It was a guy in a uniform, Mr. Policeman came to talk to her. She had him come inside, he asked if she had seen anyone funny around. Our neighbors had something taken from their car but they hadn't locked it. But mum didn't see anything. No, not me. I am not on a diet, but many of my fellow blogging buddies are on diets. Some to get thinner, some because they have rocks in their systems. 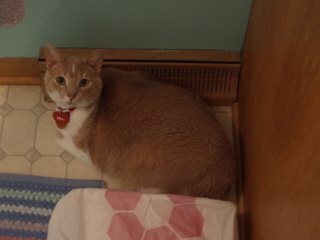 Mum says so far I am doing OK, although Grampie says I am fat. Hmph. Mum says I am not and so far the VET hasn't said anything. But I don't gets overfed either. But if my buddies end up on a severe diet you could end up looking like this. Not skin and bones, but just bones. That would not be good. Much better to have some meat on our bones. 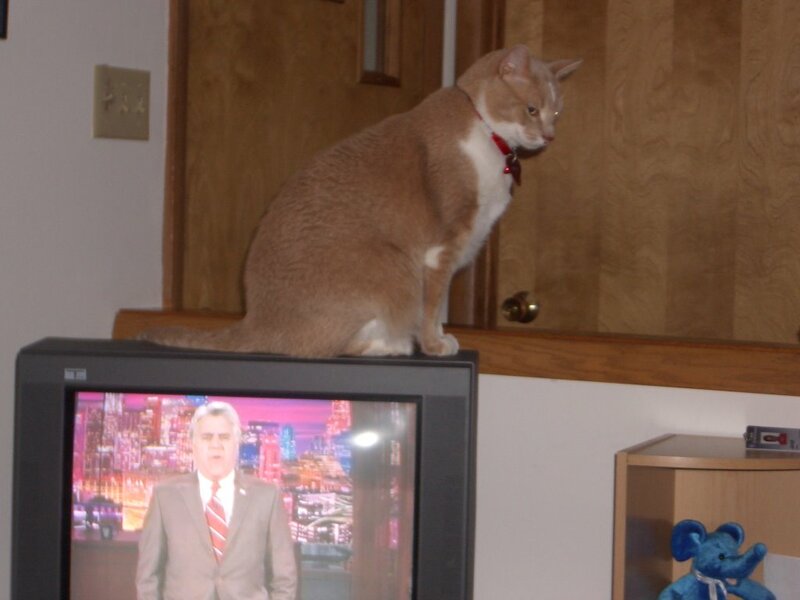 Kizmet suggested a new theme for the day - Man Cat Monday. My best pose, staring down mum when she wants me to do something I don't want to do. P.S. I made it through the worm hole this weekend. The system let me move my blog to the new blogger. When that happened lots of comments that had been properly identified with your names suddenly when to ANONYMOUSE. I know you is not Nonymouses, and now things seem to be OK. But mum is thinking about some changes, so my blog may be a construction zone for a while. So if things are missing, hopefully we can bring them back, or figure out how to bring them back. Mum says she needs a long weekend to work on this and won't have one for a few weeks. Then she will start making the changes. We have seen some nice stuff on other blogs, different templates and such. 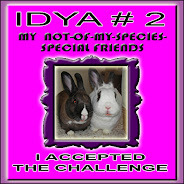 A while back Grr, Midnight and Cocoa were my winners for my first blogoversary quiz. So that had to tell me where they lived. This is what they sent! Then their mum gave the snail mail address. So that got me to wondering how to explain where I live. Mum knows the official numbers and such, but that doesn't mean much to us kitties. Like the Calico Girls live in the house in the Big Piney Woods. We all know where that is. So here is my description of where I live. Just a short way off the not busy highway. On the street that doesn't go all the way through that has a big turn spot on the end. I have the whole blue house on the north side of the street, near the turning spot, between the brown and white houses, with woofies on both sides. Brown houses on the other side of the street, one with a big water pond for humans. And more woofies. Feel free to drop in any time! Where do you live? If sunlight is not available, heat can substitute. 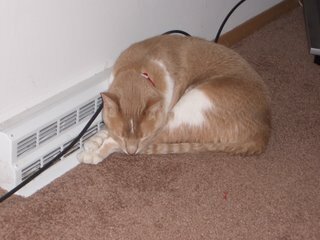 Occupy the heating vent. Cover it totally to receive full benefit. 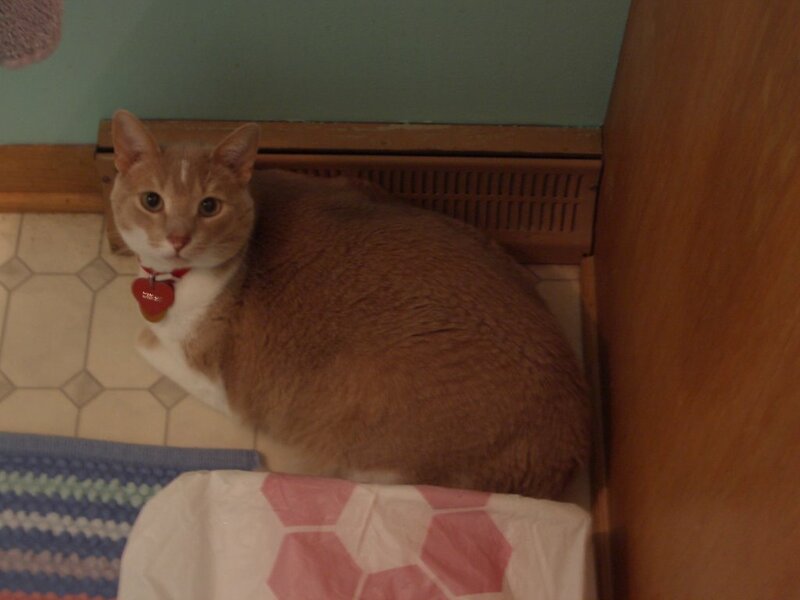 Here I am camped out by the heaty vent in mum's litter box room. Just room for one, and I turn over the little box which helps catch the warmth. Sometimes I try to cover the really big vent in the living room. But don't always cover the whole thing up. Then back by the windows that go all the way to the floor. 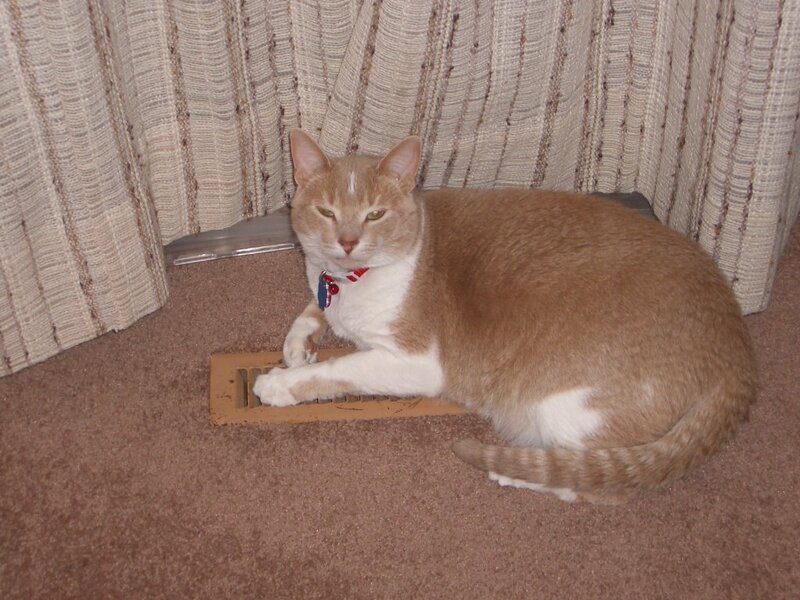 I am not completely over the vent in the picture, but I do love to lay on top of this vent. Mum tries to keep a plastic thingy on it to move the air away from the windows. But I just kept pushing it off for room for me. This makes my tummy all nice and warm. Hey don't forget to go and order your pre-publication copies of our book. 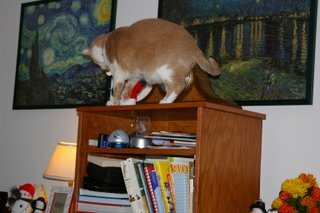 Remember this is a book by kitties for kitties to help our fellow felines in need. So step right up and order a copy. No, order several copies. They will make great pressies. Get your Christmas shopping done in January. Then just sit back and relax the rest of the year. I had mum order the book, one copy for us and extra copies to autograph and give away. We had snow again today. 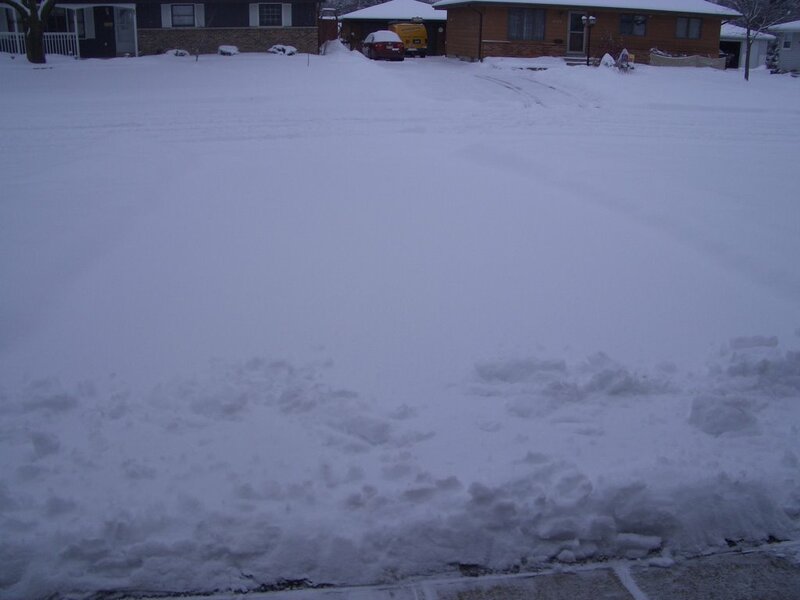 Not a lot according to mum as it didn't take her long to clear off the snow from the driveway and patio. You can click on the pictures to biggify. And Vir-ginger went out with her into the cold! First she jumped up on the snow eating machine, but mum said she couldn't stay there. Then she went and jumped into the snowbank, still with that smile on her face. Then up on the post to watch mum work. 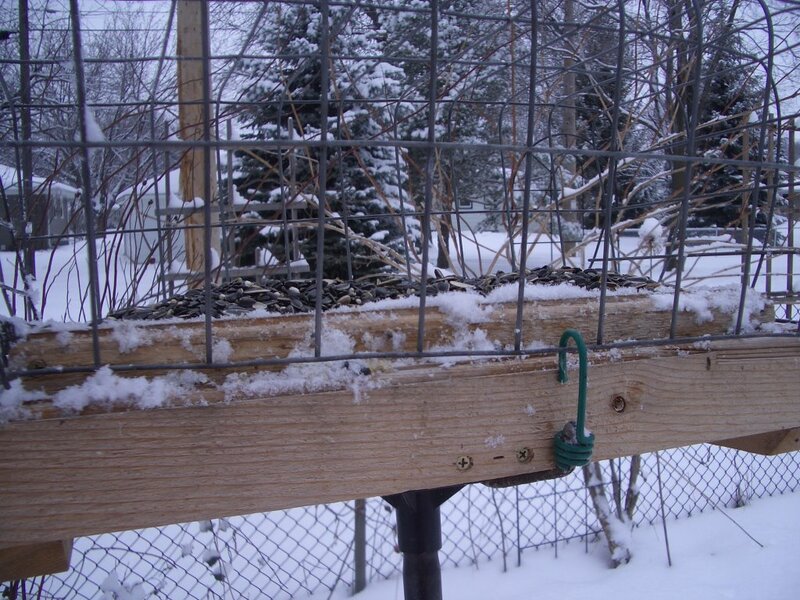 Here is the birdie feeder all cleaned up from the snow and topped off with seed for the birdies. Mum had filled it on Friday and they had eaten half of what she had put in. 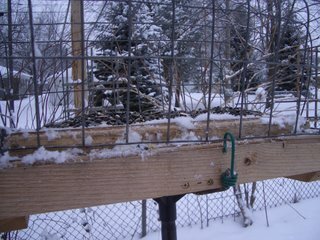 The wire around the feeder is to keep the squirrels out of the feeder. 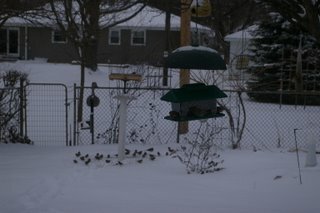 The birdies have no problem getting in to eat the seeds. And we had a special fevver visitor today. 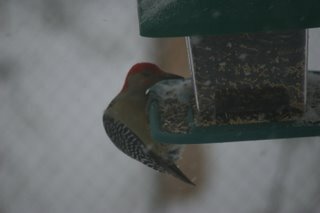 A red-bellied woodpecker. We have seen them before but never gotted a picture of them. He was getting seeds from the feeder. Then he would fly into the tree to eat the seeds and then go back for more to eat. 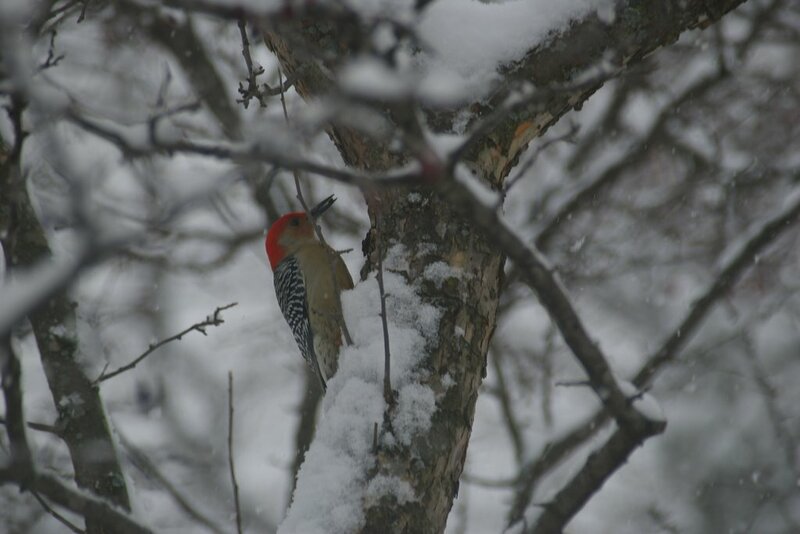 It was lots of fun watching the fevvers in the snow today. 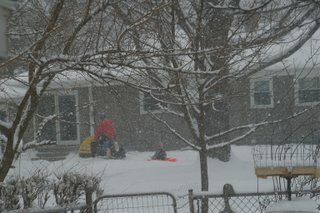 And here you can see the snow still falling, along with the people who live behind us playing in the snow. He had a snow travelling monster out and was pulling his little boy on a sled. 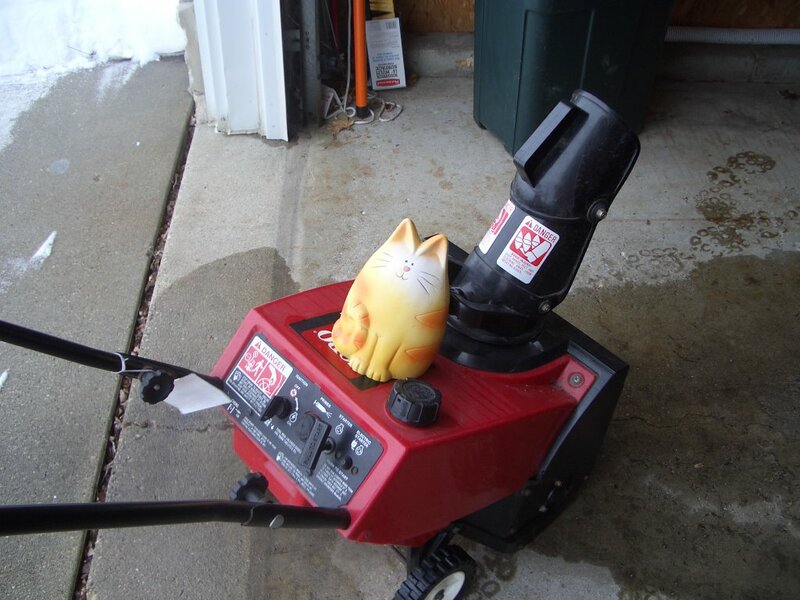 He was going furry slow and the machine was not making lots of noise. Mum said that was good, as the trail by us is only for non-monster travels. Not far away the trail can be used by the snow monsters. Hope the rest of you had a good day, we did. Humans are linked to things by finger prints. But not us kitties, not even our paw prints. What can give us away? Our noses. 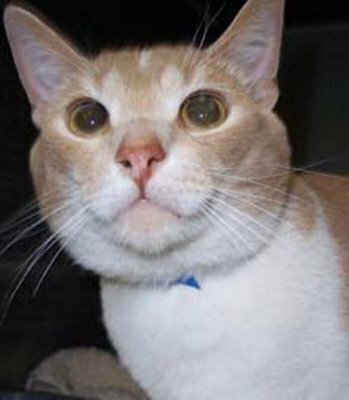 A cat most distingushing feature is the unique pattern of ridges on the nose pad. Wow, that is interesting. Plus my nose is different in that it isn't even all the same color. It has a ligher pink splotch that goes across the pad. I sure hope the Feline Bureau of Investigation (FBI) doesn't have my nose on file. Hmmm, I have been on top of the big machine with moving picturs. But mum hasn't caught me with my tail in front of it. I must be doing something wrong and not getting good ch'i. I spent my day catching as much sun as I could. Mum was all bundled up when she lefted for work, so it must of been cold outside. Since I stay inside, I don't care. No, 3-4 inches of snow isn't much for Whiskerconsin, we had nearly 12 inches back on December 1. But when mum gotted up all they talked about on the little noisy box by the bed, was accidents. So mum figured it was just safer to stay home and not risk getting hit by some stupid driver. She is a good driver and knows how to take care of herself and the big motor monster. But since the sun has gone to bed, I am going to take a nap or two by the heaty spot. Cuddle with mum once she sits down from doing all of her evening stuff. I hopes that all of my furiends who have gotten bad weathers, ice and stuff are doing OK. Mum even called Uncle Stormie, he is OK in OK. He has power and all. 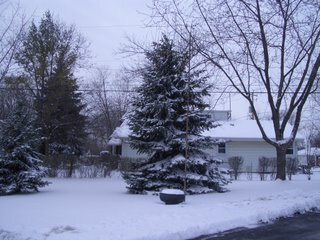 The snow machine visted here overnight so it is white outside again. 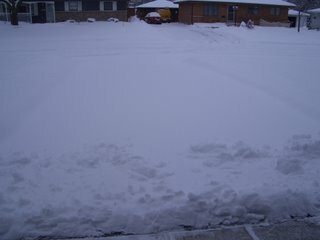 Mum says we only gotted about 3-4 inches which isn't that much. But it was slippery out so mum worked from home. So she didn't clear the snow right away from the driveway. 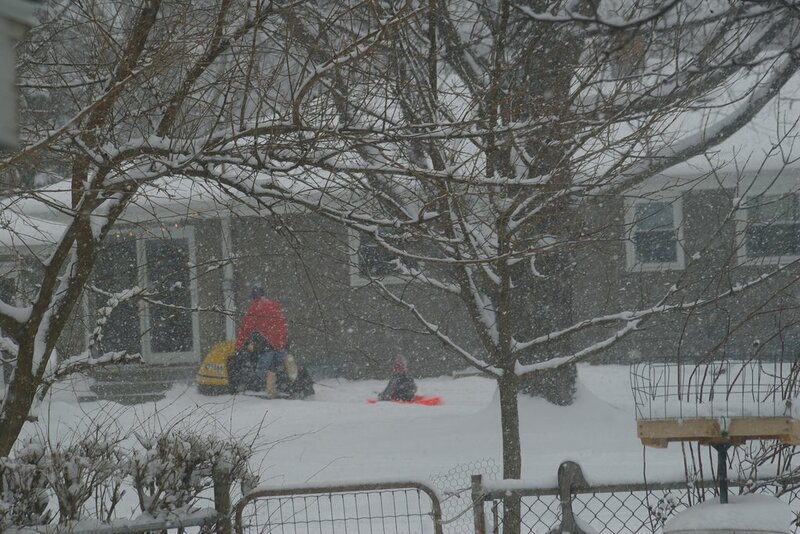 Which worked out wonderfully as the man across the street came over with his snow eating machine. 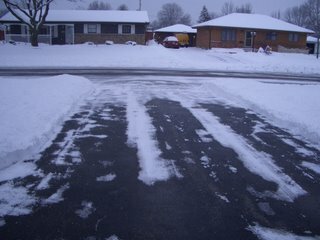 So mum just had to do the little clean up on the edges of the driveway and by the front door. Then she cleared the snow from the patio. 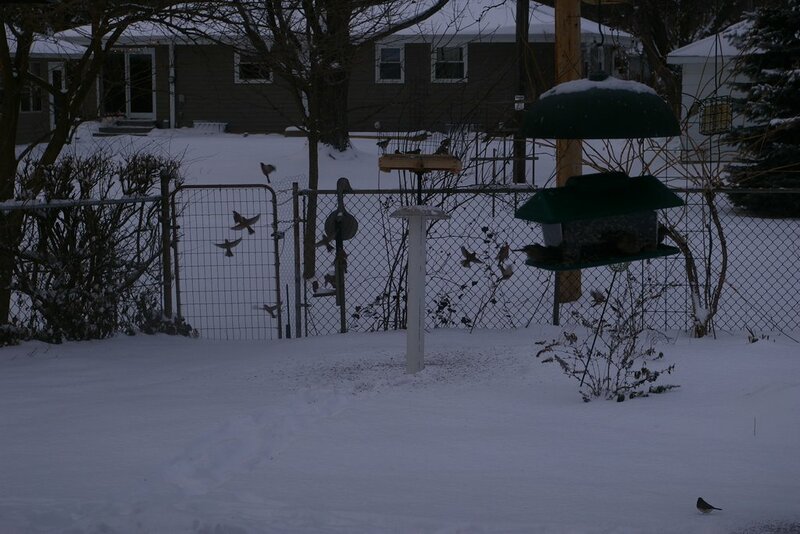 While she was out she filled all of the birdie feeders again. They ated lots over the past few days so needed more to munch on. But look at how many fevvers we hadded eating all at one time. But all of a sudden they flew off and mum caughted sight of a hawk. She even caughted the little fevvers flying away! You can click on them to biggify. 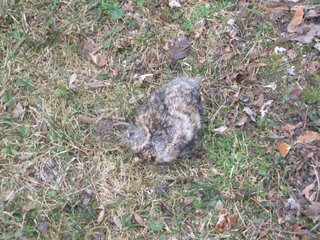 Before it snowed mum found this fur thing in the yard. It looks like a bunny fur. 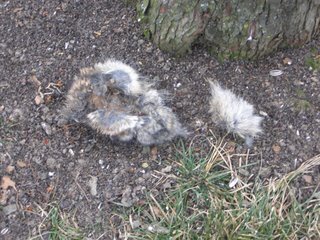 Mum was thinking that maybe Mr. Hawk came looking for some food and this is all that is left. 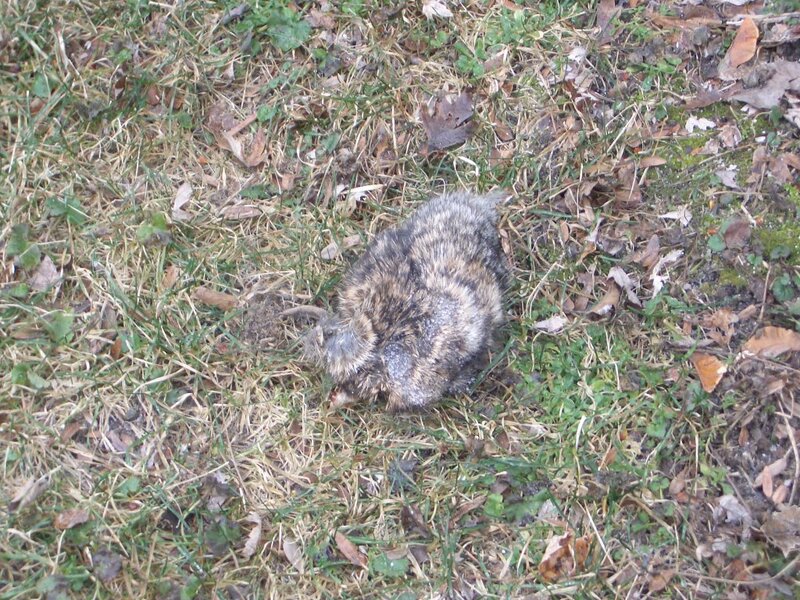 This is where she found it in the yard and she moved it over by the tree where a little more furry patch was. 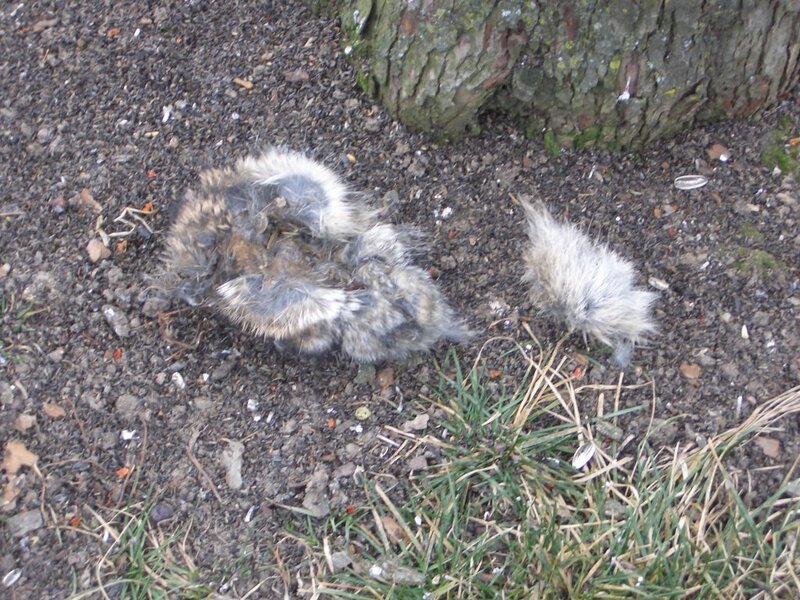 She left them outside in case some creature needs to have some fur for its nest. Oh, and about my title. 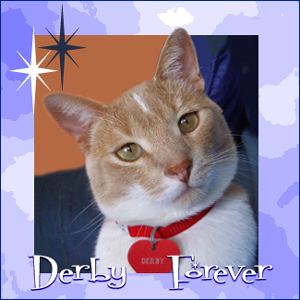 My furiends can always just call me Derby. No bowing and scraping will be required. At last that silly title thing gave me a good title, then we tried again, and got another one that was purrrty good. So I figured I would just combine them. hehehe. Otherwise I was just going to make one up for myself. 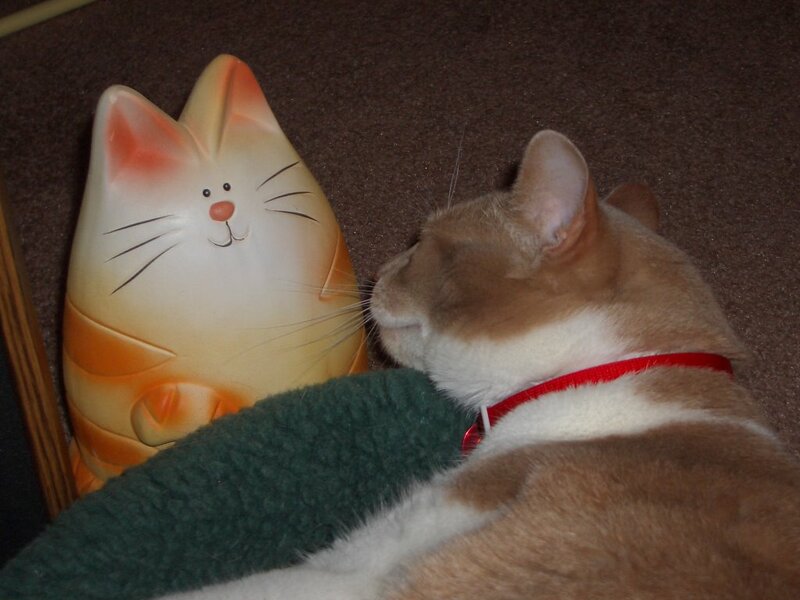 You know, I have a Princess for a girlcat furiend. Now I have a title to match hers. 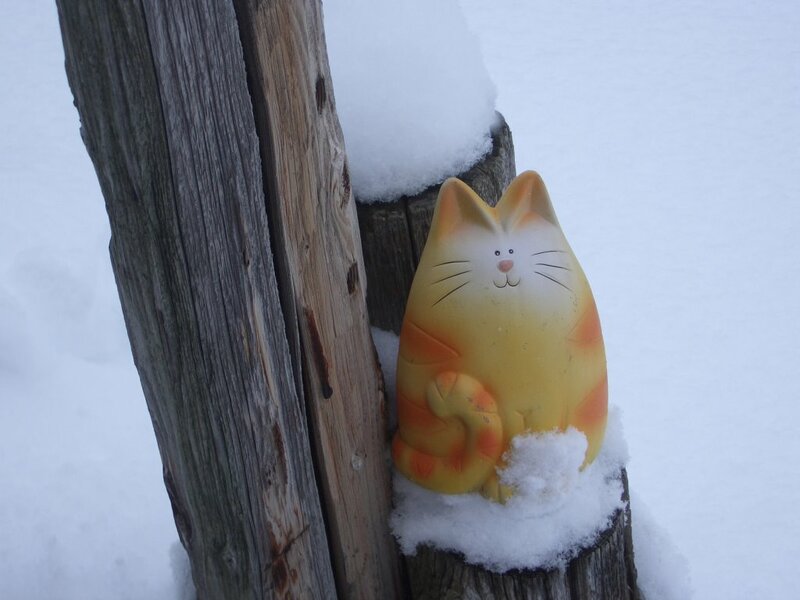 Just a furry light bit of snow overnight. The deep stuff is supposed to arrive overnight while we are sleeping. But at least we won't have ice like others have gotten. 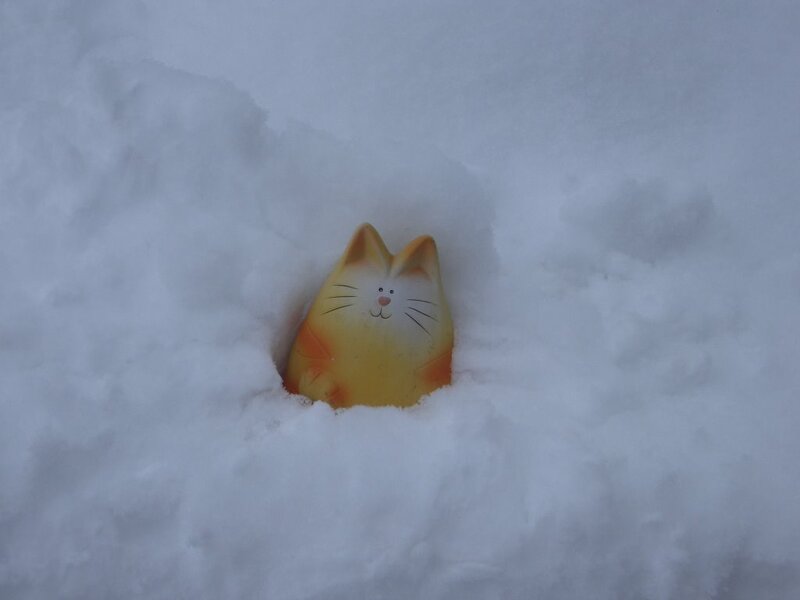 The Meowers from Missouri have gotten lots of ice and are expecting more. Uncle Stormie in Oklahoma gotted ice too. So everyone stay safe and warm, where ever you may be. This is the picture in our little local paper for the ads. Look where we get put. 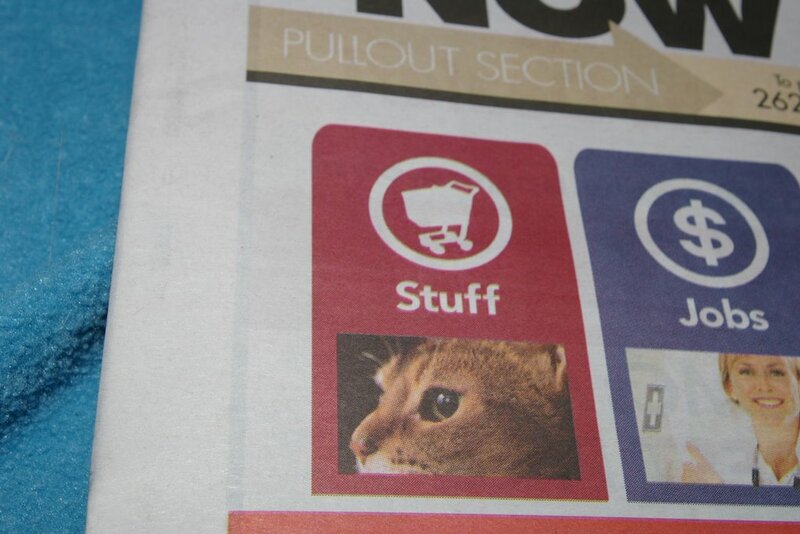 So we are just stuff? Hmph. Woofies maybe, but not us kitties. Please be assured that mum can clearly check that I am not in the dryer before she starts it. I just happened to sneak in once between loads. She had gotten the dry stuff out and turned to put the wet stuff in and, Voila, I jumped in! Mum tooked the picture and then reached in to get me out. I wasn't very thrilled with that. It was nice and warm. But no, I don't want to go for a ride in that thing. The only time the door is open to that thing is when clothes are going in or out. Latte commented that I get to go to the dungeon. Yes I do, and love going to the dungeon. Mum has parts of it where I can't get to. But other spots I can. I can even get up on top of the heating ducts where it is nice and warm! Plus my box is down there, so I have to have access. Otherwise Mum would be finding little presents in various spots, if you know what I mean. It is furry cold here today and it is supposed to snow tomorrow and Monday. 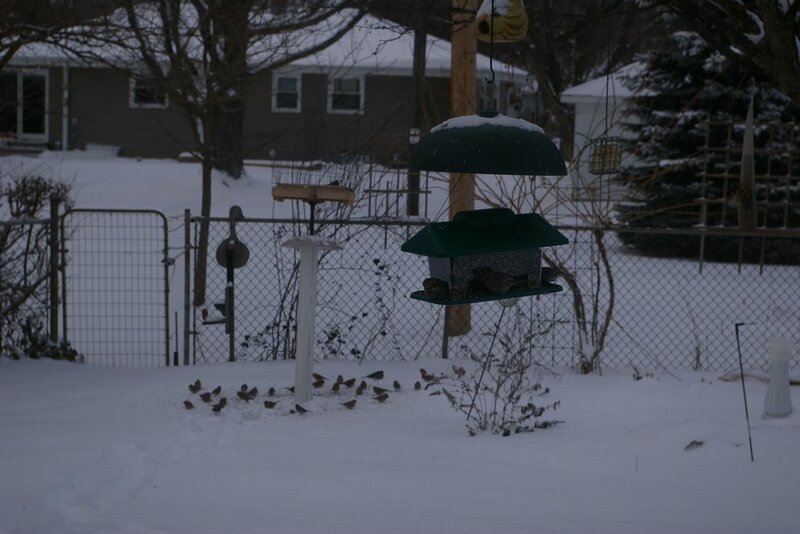 Mum gotted all the birdie feeders nice and full so they have lots to eat. 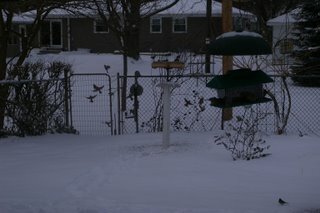 We have seen lots of birdies filling themselves up today. 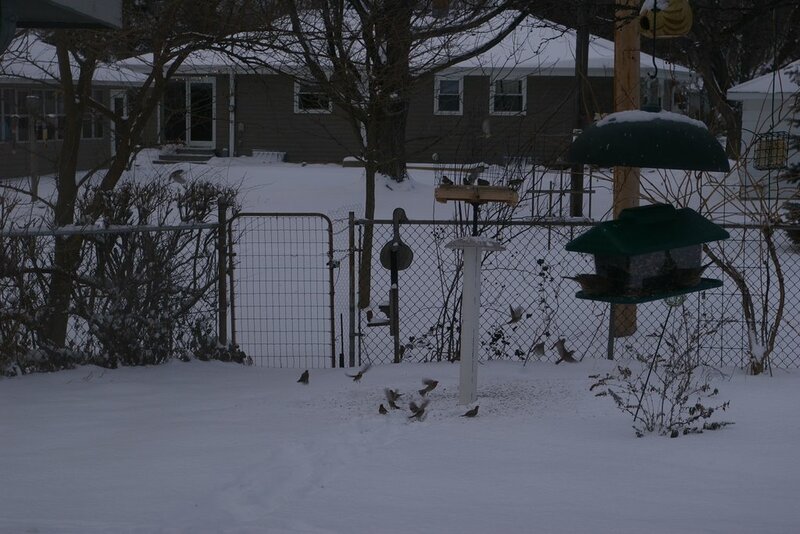 They need lots to eat to keep themselves warm. Even Mr Squirrel has been around checking out the stuff on the ground. Mum says she will have to go sweep up the patio a bit later. That way it won't be as messy when she needs to move the snow away. Mum had been busy cleaning stuff this morning. Spraying and wiping, scrubbing and polishing, picking up and putting away. Using the big sucking machine. But I do have to says the house looks, well, OK. Thanks to all for your comments about moving to new Blogger. Not sure if the Catolympic blog is affecting it or not. So for now, I guess I will just stay put. One day down the road it will happen. Guess I don't need to rush. Hope you all are having a good weekend. I think ours will be rather quiet once mum finishes with the cleaning. The inside of the clothes dryer is warm and inviting, but beware of fast approaching humans who may wish to throw damp clothes at you and press buttons. This makes for very bad ch'i. 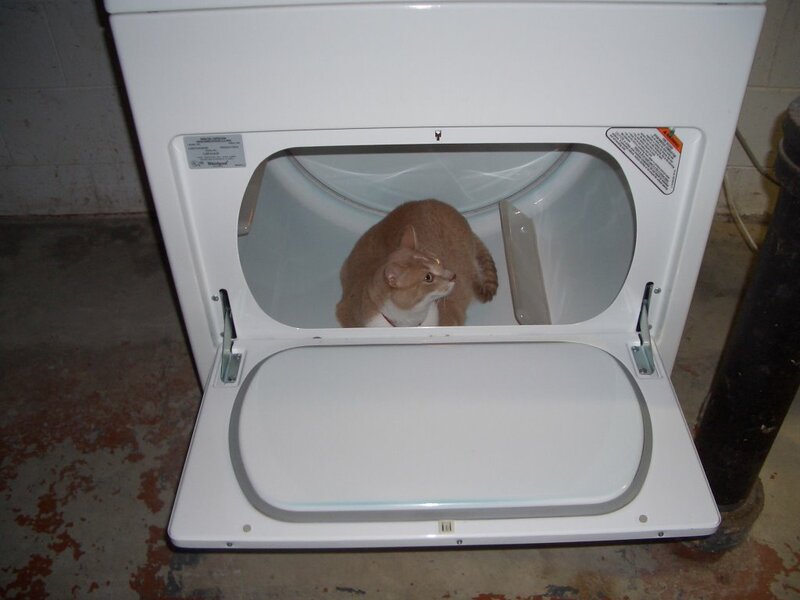 Yes I have jumped inside the clothes dryer once or twice. But mum can easily see me and makes me come out before she puts stuff in. She says I really don't want to go for a ride in this thing. 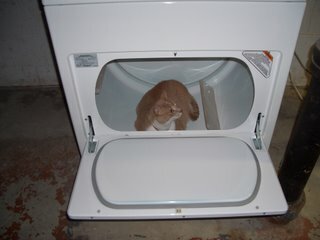 Plus my furiend Faz, has checked out his bean's dryer as well. Happy TGIF - Thank God I'm Feline. 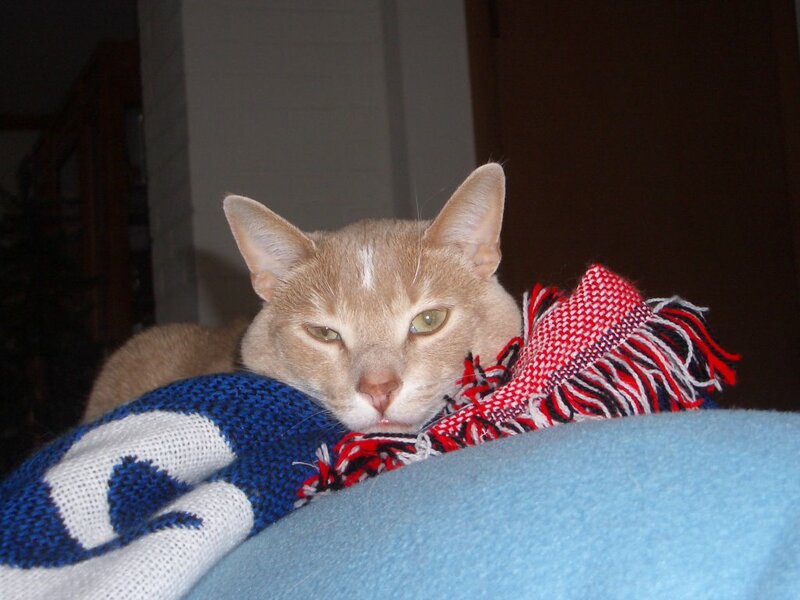 Who is or was the owner of the old Catolympic blog? I know it is NOT the Calico Girls or Timothy Dickens. I can't move my blog over to the new blogger and want to be removed as a contributor to that blog so I can move over. The Calico Girls the same! Or how can I remove myself from this blog??? More feetball! Guess I will just lay here and nap away. Maybe mooch me some treats. We had a tiny bit of snow overnight. Not enough to cover the grass, but a few white patches here and there. It even stayed on the ground during the day if the sun didn't find it. Speaking about the sun. Some of you commented that mum was unfair to keep me out of the window because the plants were there. 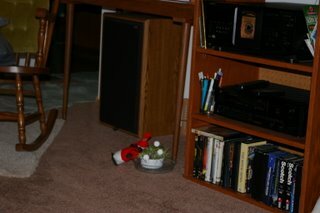 Well, off all the windows in the house, that is the only one for plants. Mum says I gets all the rest of them, so the plants get to have one and I have to leave them alone. She said she will soon be putting them in a big pot that will way to heavy for me to push off the table. Mum wented to lunch and shopping before Christmas with Miss Lynn. They were in a shop that sells pet stuff and saw these 'pets'. They are curled up sleeping in a little bed. So what? Well, just as they were about to walk off mum noticed they were breathing!? So they looked at them closer and sure enough, you could just see the rib area rise and fall. Also if they gotted an ear real close your could hear a growl or purr. They are called Perfect Petzzz. Mum says she would rather have me, than a little kittie that just sleeps. Mum likes to play with me, not just watch me sleep. 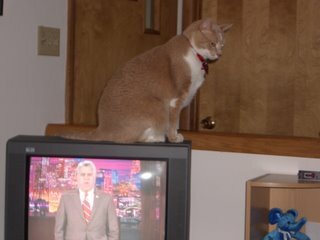 Pearl, one of our new blogging furiends, posted about this too. I suppose if your really wanted to have a kittie or woofie and couldn't, this would work. You don't need to feed it, walk it or even take it to the VET. They even suggest that you could take it to work. But it can't really play, which is one of the bestest things about us real live kitties is playtime. 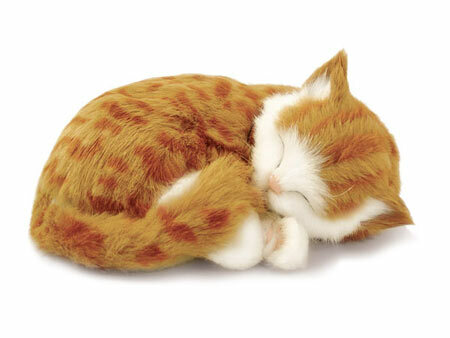 But at least the company had the great decency to make the kittie a ginger kittie. But mum says they do have tuxie's too. Meezer's coming soon. Just waiting for Mattingly and Speedy to drop in. 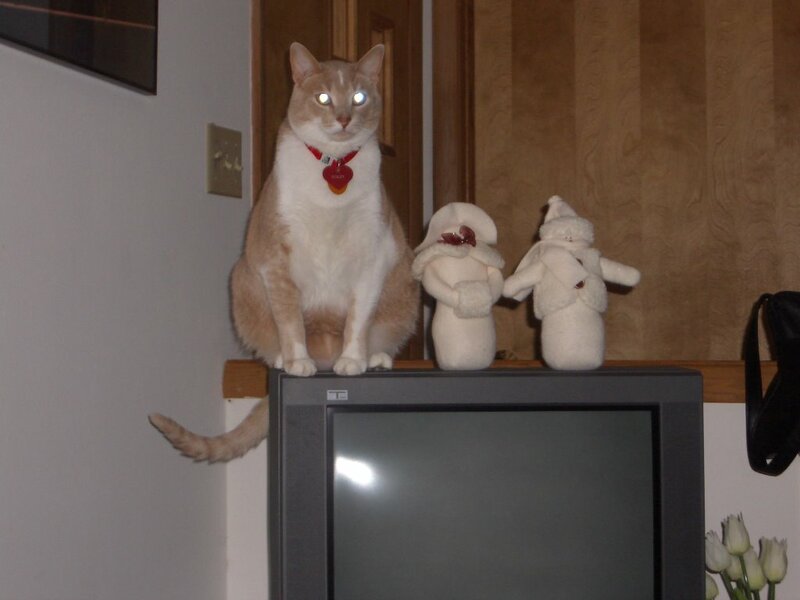 They are visiting the sisfurs, Tipper and Misty, over at Crew's Views. They want advice from me on have girlcat furiends. Since Princess Mia and I have done OK so far with our relationship. I don't know for sure. I sort of just muddle along and hope I don't mess anything up. Mia and I don't visit directly very often. We meet up when our blogging buddies have a get together, like the Nap-A-Thon or Catolympics. I did send her Mango, one of Vir-ginger's litter of Squillion, and a couple of roses. She sent me a cute little bear with a yellow rose. Otherwise we e-mail, post or comment to each other. What can I say? I am certainly not an expert when it comes to girl cats. OK, a few real basic tips. 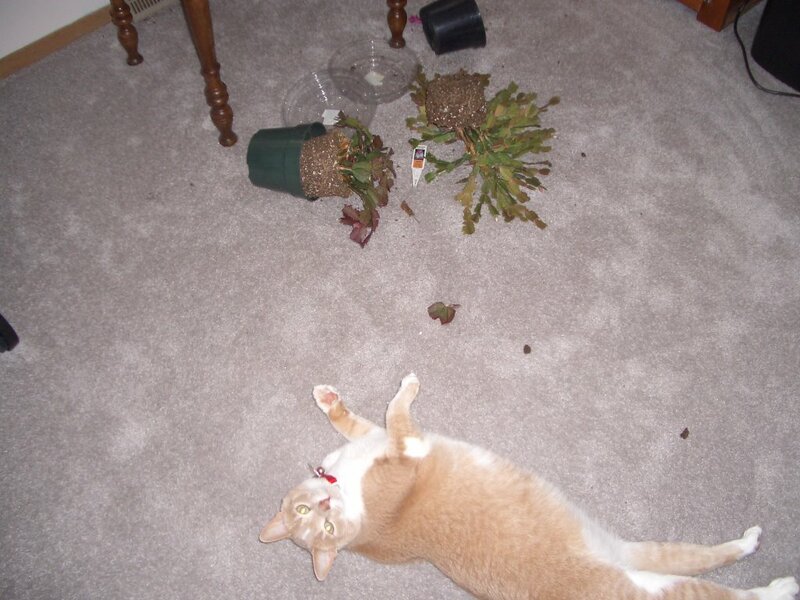 Let the girl cat take the lead on what activities to do, especially when you are visiting their home. When you play have fun but don't get over excited, most girl cats can hold their own racing, rassling etc. Don't play so hard that someone gets hurt. Don't worry so much about 'romance', just have fun and enjoy each others company. Its not like you were getting together to raise a family. You are just special furiends. Kissing their paws or maybe a gentle nose kiss is ok too. Since they live near us I don't want their mum to be mad at me and come over and give me a scolding. We want to continue to be furiends with The Crew, all of them. That is it, and if things don't go well. DON'T BLAME ME! When the official guy on the TV thing gives the weather they say it will be sunny or cloudy. That is fine for the day. But at night they never talk about the moon and it is shining so nice. 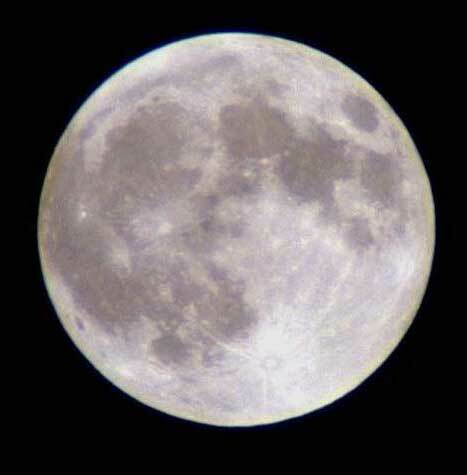 So I say it is mostly moony for tonight. Tonight when mum came home we wented into the sleepy room. The big, fat full moon was shining in the window. I just laid down and stretched out, mum stretched out my me. It was furry nice and we just snuggled for a few minutes. No howling at the moon, just getting close to my mum. This is what I gotted mum for Christmas. It is a glass block that has a picture lazered inside. 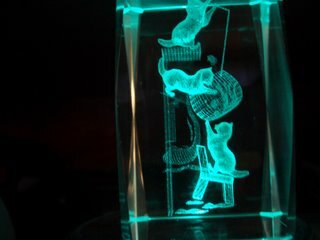 You can see kitties playing. That would be me. 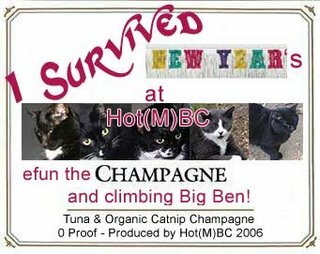 First, thanks to the Hot(M)BC group for hosting a wonderful party. We had lots to eat, drink and play with. Including the New York pole and Big Ben to climb. Mum said she stayed way too late and ended up sleeping later than usual this morning. Thankfully I had enough crunchies to get me through the night. Today, mum hasn't done much. She watched the fancy purrade with lots of flowers, then watched the Bucky Badger guys win their bowl game. Me, I started off the new year where I left off. Keeping mum busy with stuff and checking out things. 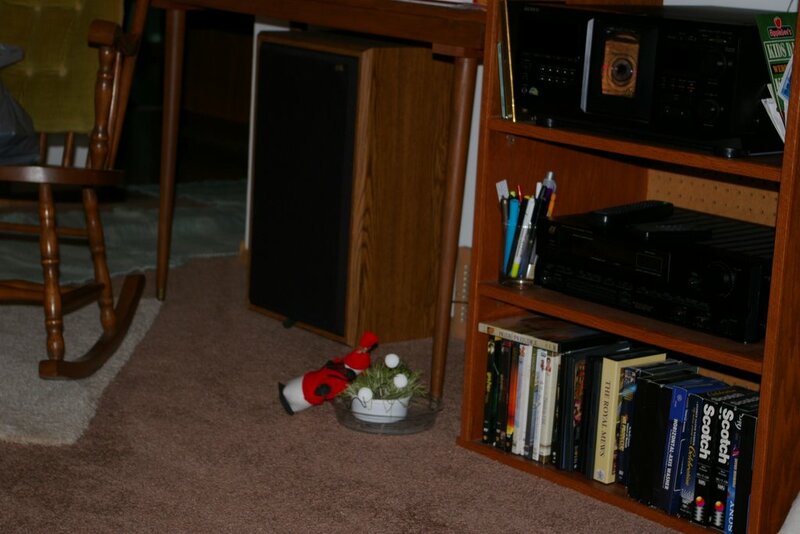 I wanted to see out the sunny window, so just created some room for me to jump up and figured since the plants weren't blooming anymore they could just be one the floor. 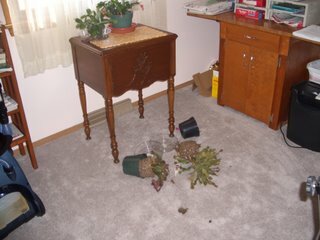 Mum was not happy with this and now that room is off limits to me. Guess Vir-ginger and I will just 'alax and think up other things to do. Hope everyone had a good day and that your new year is a success.